Is "hook and roll" the new "bend and snap"? The answer to this is YES, if Benefit have anything to say about it. 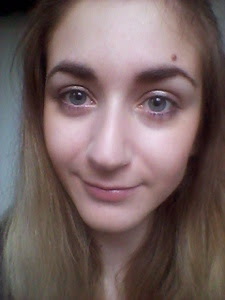 Back in the days of Winter Wonderland and what some of you may remember as 2014 (I don't know about you, but December feels an age ago), I was invited as an ELLE insider to check out Benefit's new make up launch. Exciting, right? I was greeted by a excitable dog with rollers in its shaggy fur (casual) and entered the coolest, pinkest, most PIMPED OUT LORRY EVER. I whet my appetite with a glass of bubbly and - you know me - tucked into the nibbles with aplomb. After saying hello to the lovely Joely from the ELLE beauty team, I joined the rest of the insiders on the very pink leather seating before being presented with Benefit's newest innovation by Annie and Maggie (Jean Ford's nieces): a curling mascara which keeps lashes lifted and fabulous for up to 12 hours, thus rendering the frenemy of the beauty world, eyelash curlers, irrelevant. Cue many "ooohhs" and "ahhhhs" from 15 make up obsessed ladies! The wand is where the magic happens. 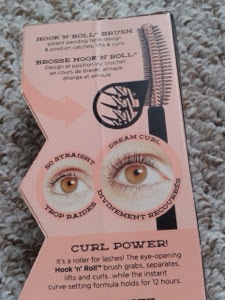 The guys at Benefit have spent YEARS trialling the perfect wand for optimum curl power, and traced the success of curling hair back to old skool rollers. 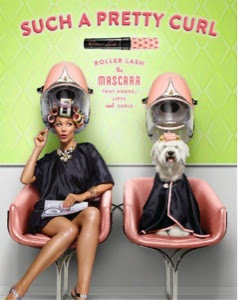 So there was their answer: bring the design of hair rollers to a mascara wand. Et, viola! Roller Lash was born. The wand has tiny hooks in specific places so that the wand grabs (it feels like a soft tug, not painful or uncomfortable at all) and pulls the lash from the root upwards towards the brow, lifting and curling at once. And then there's the formula, which contains lash-conditioning ingredients, a super black pigment, and is so fine that you can see the pink from the wand when it's coated. This, we were told, means the lashes aren't weighed down. But a little goes a long way, and lashes stay curled for up to half a day. So how did I fair? My lashes are loooong, but very straight. I often find my lashes are weighed down by mascaras, and even those that promise to curl don't last until elevensies. My lashes droop the same way my hair does after a blow dry. Not ideal. 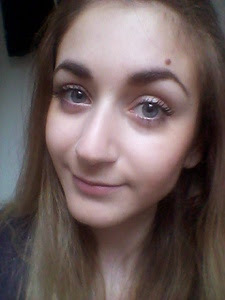 Lovers and devotees of Benefit's other two best selling mascaras - BADgal and They're Real - needn't worry about what the introduction of Roller Lash will mean: the distinctive, 50s style branding of Rollerlash means it can happily sit aside the other mascaras in Benefit's arsenal, doing it's own sweet thing. BADgal gives lashes a bit of va va voom, whilst They're Real is infamous for its "falsies" effect. Roller Lash, however, is a curls best friend (if anyone's seen the hashtag #curlsbestfriend around, this is what it's about), banishing flat lashes with a little hook and curl action. 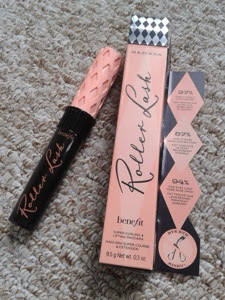 Roller Lash will be rolled out in stores (sorry, couldn't resist) in March, but the lovely ladies at Benefit have kindly provided me with a sample for this post. It's RRP £19.50, but you can pick up a sample FREE with this month's ELLE! Is anyone else keen to get their hands on this rather adorable curling innovation? This sounds so good, honestly. Almost too good to be true! But if it really hold a curl, they will surely have a loyal fan in me. As yours, my lashes like gravity just a little bit too much and don't like to stay curled, no matter what I try. So this could really be a lifesaver for me (oh the drama).